Make no mistake, this post is absolutely for the beef lover and especially the connoisseur of the highest quality aged beef. 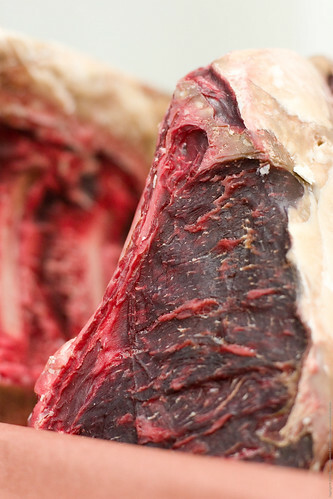 Most of us know what non-aged beef tastes like, somewhat homogeneous or one dimensional in it’s flavor. Some people experience non-aged beef as slightly metallic in flavor (the iron in the hemoglobin? ), not a very appetizing characteristic. I have always eaten fresh beef (unless you count the hamburger that has been in the fridge for a day too long which does have a different flavor indeed) and I have never had an experience with aged beef that I am aware of. Some people will eat only aged beef, having converted from the more mundane. I think that we eat what we like but also what we can get a hold of. I also think that many of us really never have access to aged beef as an ingredient but perhaps have access to it in a fine steakhouse setting. The restaurant experience separates us from the reality of the ingredient so I thought today’s post would be of interest to all of us. What is wet aged beef? 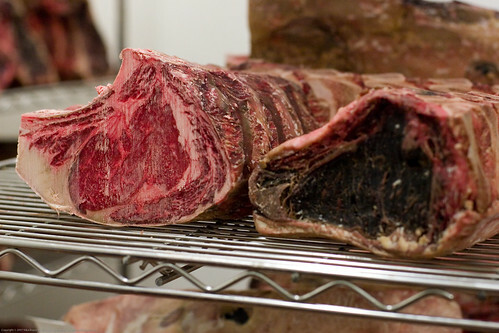 What is dry aged beef? 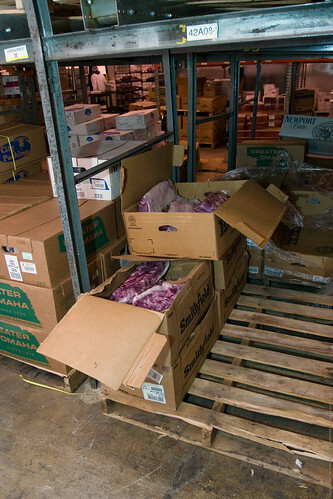 What does the dry aging room at Dole & Bailey look like? Muscle fiber relaxation is a physical process that occurs after the animal has met it’s demise. First, the muscle fibers seize up for half a day or so and then the pH changes in the muscle fibers after which they slowly begin to relax (wiki). This occurs in all animals with muscle fibers, including fish. 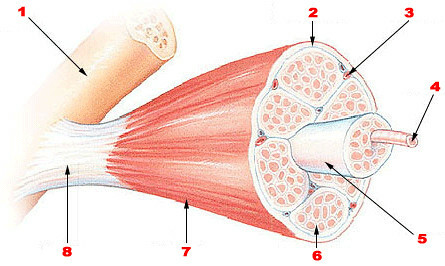 Skeletal muscle bundle -> 1- Bone, 3 – Blood vessel, 4 – Muscle fiber, 8 – Tendon (connective tissue) [Sources (1 and 2)]. Connective tissue (collagen in the tendons and other connective structures) breakdown occurs for different reasons, at different rates in different muscle groups, to different degrees, and at different times throughout the aging process. Wet aged beef is usually large “primal” cuts of high quality beef that is vacuum packed in tough plastic bags and allowed to sit at cool temps for a desired period of time. This meat passes through the tenderizing process and then begins to develop flavors based on the anaerobic (oxygen-hating) bacteria (L. sakei and L. curvatus – link to paper – PDF) that reside inside the bag. These bacteria help to breakdown various components of the muscle tissues and the breakdown products impart the characteristic flavors to the meat. Because the meat is sealed away from air, it does not lose moisture and thus there is not an appreciable loss of product over time. This makes this method very attractive to producers and steakhouses because it makes for a less expensive yet delicious product. People say that wet aged beef has a distinct “aged” flavor without the potential “gamey” or “musty” flavor some report with dry aging. 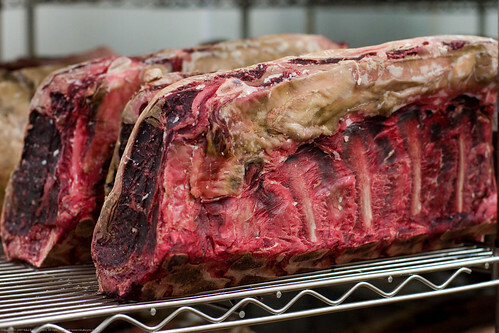 Dry aged beef (which may have been wet aged previously for a mixed type of aging) is also done on the larger primal cuts or even a whole side of beef. It is done in a climate controlled room with constant air exchange, bug and bacteria lights, constant temperatures (34 – 36 F) and a constant controlled humidity to control moisture loss. The bacteria that are doing their work in this setting are both the aerobic types (on the exterior) and the anaerobic types (on the interior). 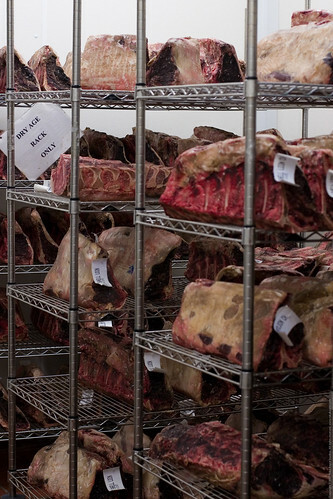 As with cheese caves where the population of specific bacterial and fungal species are unique to each cave and which give the cheese the unique flavor profiles and textural characteristics, so too does the beef dry aging room have a unique bacterial ecology which has a unique impact on the beef aged therein. Recently, I had the privilege of walking through the facilities of Dole & Bailey, family-owned purveyors of fine meats, pantry items, dairy, exotic spices and ingredients, seafood and fresh produce. This walk-through included a chance to walk into, experience, sniff, oogle at, and photograph their 20 year old dry aging room (vault, cave, piece of paradise, what have you). 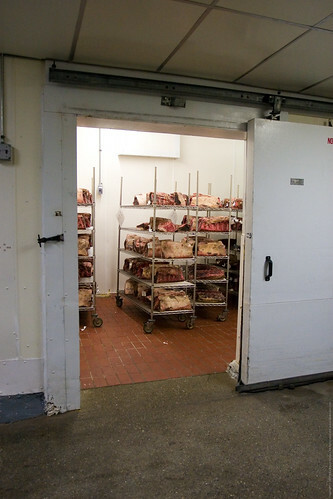 To enter the Bos taurus inner sanctum, you walk through this heavy sliding freezer door. When opened, the positive pressure of the room billows out the distinct aromas of a well seasoned dry aging room. It is hard to articulate really what it smells like. It is certainly not like a room where fresh meat is stored, it smells like meat but nothing at all like off-meat. You can tell from the aroma alone that something special is happening to these slabs of beef. Big Ed (Ed Brylczyk, Regional Sales Manager at Dole & Bailey), was my guide that day. He was fantastically knowledgeable about the entire company and was quite passionate about each food that he showed me. He took me into this dry aging room and explained the process and also talked about how and why he likes both wet and dry aged beef. You can see the various types of steaks here, end on. Dole & Bailey (Big Ed, and others) have standing and special orders from area chefs for certain aging protocols (wet for so many days, dry for so many days) on certain kinds of custom cuts. 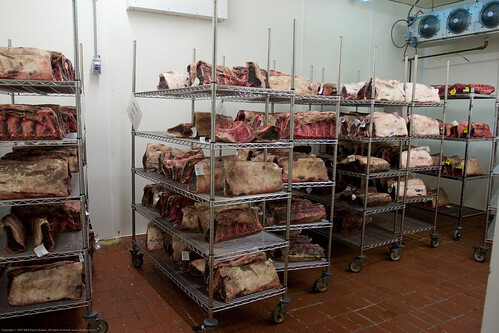 At any given time, you will see a completely unique set of cuts being aged in this room. According to Big Ed, the summertime is high season for these kinds of orders so I got to see the room well stocked. The name of the client is printed on a tag and attached to their custom ordered dry aged beef. Here you can see that the type of cut is also labeled. Notice how this looks very different from fresh beef. I didn’t touch any of this but it certainly seems like it would be firm on the exterior and also you can see changes to the fat. Also, notice how its not brown but quite red, a dark red. Notice how different the meat looks on the exterior of the dry aged meat compared to an end that has been cut. The interior meat is still red and this particular shot shows a well marbled one. 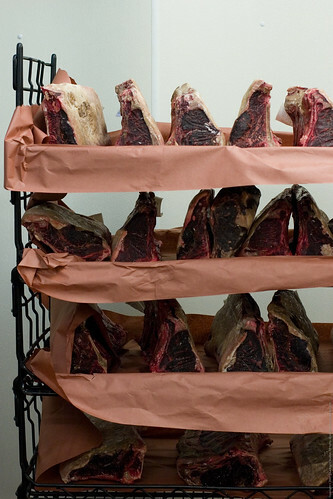 Aging beef, dry or wet, tenderizes and boosts the depth and complexity of the flavor profiles in beef. You can not go wrong with giving this a try. I know that it is something that you find in a more expensive restaurant but if you find yourself presented with the opportunity, be experimental, try it. I plan on it. Big Ed made a very important comment about aged beef and especially theirs. When you eat this meat in the restaurant, you will notice how fantastic it tastes. One huge reason you will find this difference compared to the steak you find at the grocery store or lesser restaurants is that the beef used in dry aging is of the highest grade. Often, one can not even find this grade of beef in the grocery store. Starting with such exemplary beef, the outcome is sure to be a steak that is magnitudes better than what you are used to. People just do not dry age poor quality meat so choosing dry aged beef will ensure a high quality steak, a priori. I love aged beef! I live in NYC and I first had it at Peter Luger’s.Unbelievable! Anyway I finally had the opportunity to actually purchase some aged beef from Stew Lenard’s(great homely grocery store-google it! 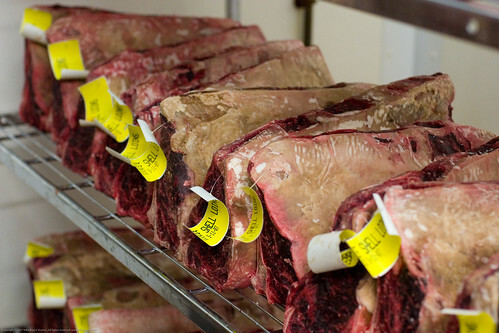 ).They have their aged beef in a case with many different cuts and date tags. I bought a porter house, which was alittle over an inch. I cooked it to medium and the taste was amazing! Shades of Peter Luger! That was over a month ago, recently for father’s day, instead of going to an expensive steak house, my wife decided to buy an aged steak, which was fine with me! $28 as opposed to $300+ was fine with me! Great taste, but the only problem was I thought we got it two thick at a little over two inches. Next time I’ll stick with the thinner piece. I’m giving the bone to my friends dog. Everyone should try aged beef, I find it hard to eat regular steak again. Thanks for the article, I really enjoyed it! Great work!